When my daughter was little, we had a silly little tradition of pushing the furniture aside in our living room and dancing around and singing with our favorite CD’s (Jewel, Alanis, sometimes even a little Backstreet Boys per my daughter’s request) until we were plum worn out! Those are some of the best memories I have, and I hold them close to my heart. Sometimes, when I have the whole condo to myself and no one is watching, I’ll relive those moments, spinning, shaking and twirling to the beat of my favorite songs. It’s a carefree feeling that just soothes the heart and soul. I think the world would be a much better place if we all did a little dancing when no one’s watching. The outfit I’m wearing in today’s post carries over that whimsical, carefree feeling with it’s softly textured half sweater and flowing gypsy skirt. 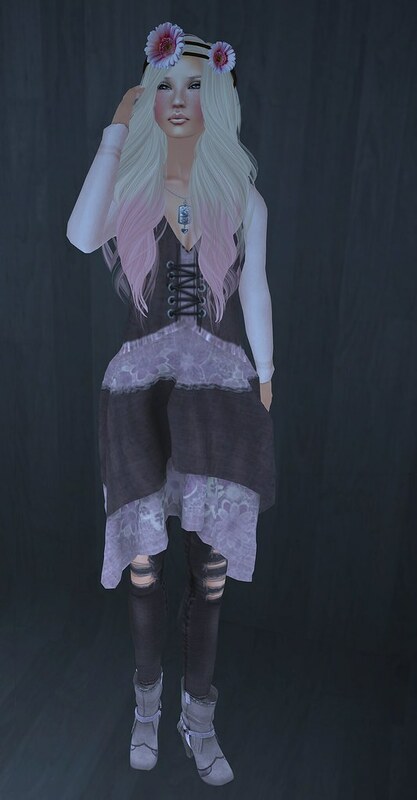 Both of these comfy Second Life fashions can be found at the Boho Culture Fair happening now through October 31.